I suspect most new users, who are generally also new to whichever subject brought them to SO, also don't know about this feature. It seems like making them aware could help prevent many 'too broad' and 'off topic' questions like "what are good books on x?" and "how do I learn basic concept?" Most of them aren't trained on how to ask questions, although (it turns out!) there are links to the wikis when adding tags on the Ask a Question page. However, many users — especially new users who most need the wiki feature — do not use the site in any of the ways above. Personally, I am often looking for very specific information and not general education or tutorials, as those are specifically discouraged as not on topic, and have always viewed tags as "a way to filter results" rather than "a way to browse or find broad education materials." So, should more attention be drawn to this feature, and if so, how? Perhaps a section on tags in the Help > Tour? Giving the links a more descriptive name or more prominent placement? A lack of tag wiki exposure is very problematic. I strongly believe that users who find the tag wikis would avoid asking frequently asked questions and common pitfalls. Many topics addressed in the wikis, especially for highly active tags, are the broad solutions and guidance that common questions are looking for. There are links in there for recommended reading material, tutorials, frequently asked Stack Overflow questions, canonical posts (which can be rather difficult to locate), a general overview of the technology, and references for trusted documentation. This high quality material is carefully maintained and yet no one seems to view it. It should be no wonder that they aren't given the priority they need by either new users, search engines, or even OLD users. The tag would be the "question": What is X? How do I use x? Votes would indicate its usefulness as a tag. This would help curate the process for burnination, too. The "answer" would be the excerpt and wiki contents. I plan to flesh out this idea later, but I want feedback on what I've thought of so far. They should, but not for humans. Apparently, were SO following its own rules, allowing no forum-like questions, there were the little need in tag wikis at all: the knowledge would have been already properly gathered and organized in the form of the questions. But we have what we have - a forum that is spammed with millions of garbage questions where no serach engine is able find a reliable and up-to-date answer. Apparently, a tag wiki is of any use only for the former. Therefore, it should be better exposed for the search engines, but there is little use to push it for anyone who is asking a question. If they didn't bother to search beforehand, if they didn't bother to click similar questions - it's very naive to think that a link to the tag wiki will be clicked. Personally, (after trying to create and maintain one for a long time) I found tag wikis the worst method of organizing and sharing the knowledge (you can't even give a link to the particular section!). As a result I abandoned the idea and started a dedicated site, which proved to be way more reliable and secure for sharing my experience. In a way, tag wikis is yet another example of the mutual exclusivity of the site rules. We don't allow multiple-answer reference questions (I were forced to delete one of my own), yet a tag wiki is but such a multiple-answer reference question, unreliable when it comes to the matter of answering the particular question. 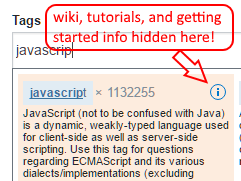 Making "Answered in a tag wiki" closure reason unusable. Which makes tag wikis again not for those who ask but for those who search, and therefore not for humans but for the robots. Doesn't mean it doesn't need more exposure, though. I suspect most new users, who are generally also new to whichever subject brought them to SO, also don't know about this feature. It seems like making them aware could help prevent many 'too broad' and 'off topic' questions like "what are good books on x?" and "how do I learn basic concept?" Well, the more problematic aspect seems that we need to have more exposure and highlighting when adding the required tags. But the general experience is that new users (LOL regarding your state of that) don't read any popups, warnings or any other hints, when they want to put their questions through all the engine's already existing filters and throttles though. Check every relevant information you see here, before applying that tag to your question please. Not the answer you're looking for? Browse other questions tagged discussion new-users tag-wiki user-interface tooltips . 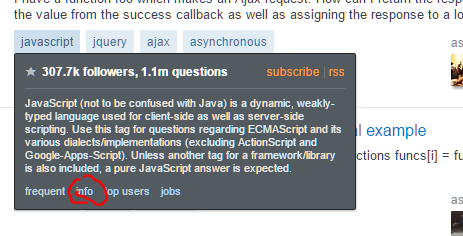 What should be done about this specific famous controversial question asking when to use Node.js? How can we reduce the number of blank tag wikis? Can we have a link to documentation topic/example from the tag wiki?